The Russian Air Force has conducted more than 60 flights and bombed over 50 Islamic State targets in three days, according to Russia’s top armed forces official. He added the strikes have significantly reduced the terrorists’ combat capabilities. “The airstrikes were being conducted night and day from the Khmeimim airbase and throughout the whole of Syria. In three days we managed to undermine the terrorists’ material-technical base and significantly reduce their combat potential,”Lieutenant General Andrey Kartapolov, head of the Main Operation Directorate of the General Staff of Russia’s armed forces, told reporters on Saturday. Another bomber on a sortie from Khmeimim has dropped a KAB-500 air bomb on an Islamic State camp near Maarrat al-Numan. It destroyed fortifications, ammunition, fuel and seven units of equipment, Konashenkov said at a media briefing on Saturday. KAB-500 bombs are accurate to within five meters. 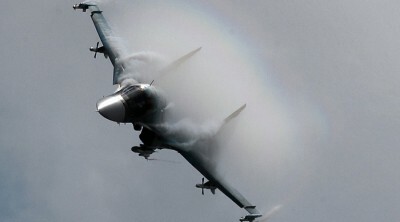 The Russian Air Force has also eliminated a workshop in Idlib province, where terrorists have been mounting large-caliber machine-guns and other heavy armaments on pickup trucks. Drones stationed at Khmeimim airbase are maintaining “round-the-clock monitoring of the situation in Islamic State’s operation areas,” Konashenkov said. “No operable air-defense systems have been spotted in the Russian Air Force zone of action in Syria. Nevertheless, all operational flights are being performed with activated defensive onboard [radioelectronic combat] gear,” the spokesman said.